Milena Petrova is an Associate Professor at the Department of Finance where she teaches real estate and corporate finance at the graduate and undergraduate levels. Prof. Petrova has also taught at SDA Bocconi School of Management as a SDA Professor of Corporate Finance & Real Estate and held visiting positions at Amsterdam University, the Netherlands and Bocconi University, Italy. Petrova’s particular areas of specialization are real estate investment trusts, commercial real estate valuation, real estate asset pricing, real estate in a mixed-asset portfolio, corporate governance, corporate financing strategy and corporate restructuring. Her research has been published in top international journals including the Journal of Banking and Finance, Financial Management, Journal of International Money and Finance, Real Estate Economics, Journal of Real Estate Finance and Economics, and others. Dr. Petrova has won multiple awards and grants for her research and teaching and presented her research to over 70 international conferences. Besides being an active researcher, Dr. Petrova is a well-recognized real estate expert and as such has trained and consulted for investment professionals in the USA, the Caribbean, Europe, Asia, Africa and the Middle East. As a consultant she has advised on M&As – valuation, post-merger integration, and exit opportunities; corporate restructuring; business plan evaluation; and the development, acquisition and financing of commercial real estate. She has also served as an advisor in setting up REITs and use of tax deferred exchanges. Prior to her academic tenure, Dr. Petrova worked in management consulting (Booz Allen Hamilton) and project finance (Finnvera). Prof. Petrova has a Ph.D. in Finance from the University of Florida, a Master’s Degree in Finance from Hofstra University, a Master’s Degree in Business Administration from Helsinki School of Economics, Finland and Post-Graduate Certificates in Fintech from Oxford University, the UK and in Industrial Management from the Helsinki University of Technology, Finland. 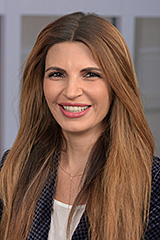 Dr. Petrova currently teaches Real Estate Modeling, Real Estate Finance and Investments, Real Estate Principles, and Financial Management at the undergraduate and graduate levels. Professor Petrova's primary research interests are in the areas of commercial real estate pricing, real estate operations, REITs, real estate capital markets, corporate finance and corporate restructuring.